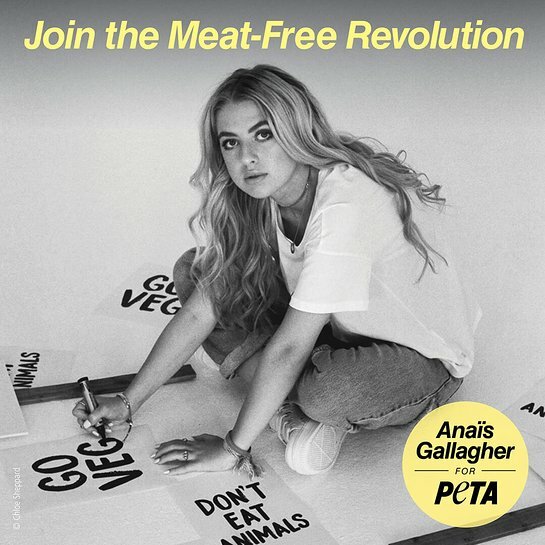 Model of the moment Anaïs Gallagher is the face of PETA's new “Meat-Free Revolution” campaign. In the black-and-white ad shot by fashion photographer Chloe Sheppard, Anaïs – daughter of Oasis' Noel Gallagher and socialite Meg Mathews – is captured working on handmade protest posters reading, “Go Veg” and “Don’t Eat Animals.” The collaboration is part of PETA’s campaign to encourage people to leave animals off their plates. PETA – whose motto reads, in part, that “animals are not ours to eat” – notes that in today’s industrialised meat production, animals are crammed by the thousands into filthy, windowless sheds. They’re torn away from their families, mutilated, and denied proper veterinary care. 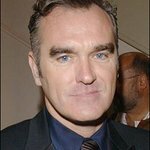 In addition to sparing animals a miserable life and a terrifying death, a meat-free diet reduces the risk of heart disease, stroke, cancer, and obesity – and a recent United Nations report found that a global switch to a vegan diet is necessary to combat the worst effects of climate change. These are just some of the reasons why 20 per cent of 16- to 24-year-olds in the UK have chosen to ditch meat.